Description: Our thoughts that take us away, and leaves our mind and eyes blurry. When the Great Depression took place it changed the lives of many people, there weren't much to eat, people became homeless because they didn't have the financial stability to pay for their homes and Innocent souls lost their lives, It was a devastating time but despite the difficult circumstances, there were people who kept the faith, and didn't give up when they got knocked down. But when things in our lives become overwhelming and impossible. Life gets hard, we lose track of handling the difficult situations in our lives. We become vulnerable to our thoughts and feelings. We forget about how our lives once were, we stop reminiscing on the good old days and only concentrating on the negatives. 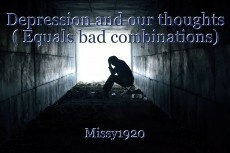 We become depressed for several reasons. Depression comes in different forms; We get depressed because of our love life, our body, financial problems, unemployment, and because of our jobs and work environment. We start to feel hopelessly unmotivated, and emotionally unstable. Our thoughts then start to control how we feel and act. It becomes nothing but black and white. Minds become uncontrollable and unbearable with thoughts that we have no power of, we then start to desperately find comfort in medications, and when the medication stops working we slowly start to feel paranoid and our mind constantly starts reflecting on dying and with pride, and ego and not wanting to appear vulnerable to others, every obstacle of our lives becomes acceptable. The ''Why was I born? I hate my life, and I wish I was dead-I'm so sick and tired of living.'' Secretly becomes part of our daily spoken vocabulary words. When life gets us down and stressful dying is necessarily not the end of everything. Because one day with no one seeing what we may see, our life will flash before our eyes leaving us with the regrets of things we did and didn't do. Quote by me: To the weak minded and lonely souls, life is a roller coaster journey and through life, we will struggle with self-esteem and understanding who or what we want to be in life, but we will learn things on our paths that a book or someone else will never teach us. Experiences and challenges give us strength and determination that will last a lifetime. Wow. What an insightful piece. Well done. A very relevant perception of mind by the author, addressing the human spirit held within the constraints of human body. 'The Men' - Got no place for them in my Life. I will never give up, will you? LOKTANTRA KI AVYASHAKTA KYU HE? This page was created in 0.4806 seconds.